You already know that you’re going to record your audio to your iOS device, so the next step involves getting the correct audio interface and making sure it work works with your iOS device. This process involves either making a direct connection to your iOS device or using the camera connector to connect your audio interface with your iPad. Because it’s uncertain whether the camera connector will work with your iPhone without jailbreaking (and that’s not recommended), it’s best to stick with the iPad if you need to use the camera connector. In fact, for live recording in general, it’s best to stick to iPads, given the hardware advantages and wider availability of DAW options. Docks provide a tailored experience for iPads that connect between two or four audio inputs directly to the iPad, along with a headphone connection and a main volume control. When using a dock, you get both an instantly available connection to your iPad as well as integrated controls packaged into a single piece of equipment. That’s an advantage — you know what you’re getting and you can count on a usable audio interface. Docks also provide power for your device while you record, so you don’t have to worry about battery life during the recording process. 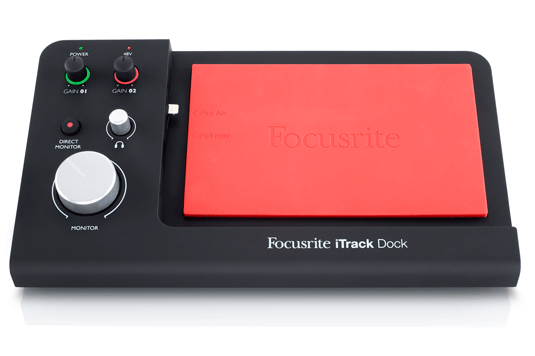 Even the largest docks only make four inputs available, so you don’t get a large number of simultaneous audio tracks to record. Four tracks might work for a small folk group, but a loud rock band with a full drumset will certainly need more than four inputs. You can use a dock to record live audio, but it restricts the kind of live audio recording you can perform. Manufacturers design docks for specific models, and you may notice that future iOS devices may not work when they get larger or smaller than what the dock allows. Don’t count on a dock working with anything except the specified iOS device for which the dock was built. The camera connector works with more than cameras — you can use it to connect other devices to your iPad, and everything will work just fine. At issue, though, are the types of devices that work with the camera connector. Apple permits only a few audio and MIDI devices to work with the camera connector, and those devices must use a couple of standard protocols. Apple developed Core Audio to help audio interfaces and software function correctly with iOS and OS X. Luckily, you don’t have to get too technical with Core Audio — just check that your audio interface is Core Audio–compliant when you purchase it and you’ll be good to go. That compliance indicates that the drivers and software that power your audio interface will work with iOS, although it’s best to do your research and to make sure the interface will work with your iOS device and apps. The other compliance you need to check for is class compliance. This compliance indicates that the audio device uses the software present within iOS to function in connection with your iPad. Because you don’t normally get the chance to install driver software for external hardware on an iPad, you need to make sure any device you try to use is class compliant. Even if the audio interface shows Core Audio and class compliance, do your research before you buy it. Check the Internet for reviews and complaints about the model you wish to purchase and ensure you don’t see any problems coming down the road. Some devices just don’t work properly with iPads, and you need to make sure any decisions you make come with the proper amount of background information. Make sure you also check the supported iOS version. Make sure the audio interface you plan on using comes with some kind of external power supply, as recording on the iPad means you’ll be using a lot of battery power to make everything run. Without that power supply, you run the risk of watching you iPad go blank right in the middle of a song. Because the iPad offers only a single connection, you’ll only be able to physically connect your audio interface to your iPad. That limitation isn’t a problem for your headphones or monitors, because you listen through your audio interface during recording anyway. However, if you want to use anything else, you’ll need to make that connection through Bluetooth or via MIDI. The actual connection process couldn’t be simpler. Plug in the audio interface. Turn the audio interface on. Open your preferred DAW app. Open the settings for your preferred DAW app. Check the audio setting and make sure you can see the audio interface you wanted to connect to your iPad. If you don’t see the audio interface hooked up to your iPad, try any of these different solutions. Unplug the connection and reseat it. Turn the audio interface off and back on. Reboot the iPad. You could also perform a hard reboot, where you hold both physical iPad buttons for eight to ten seconds until the reboot occurs. After you get everything up and running, test to make sure that all of your channels work correctly before you record your final product. Plug in all of your mics, enable Record for all of your channels, press Record, and see what happens. You want to be sure that audio goes to the proper channels without glitches or problems. 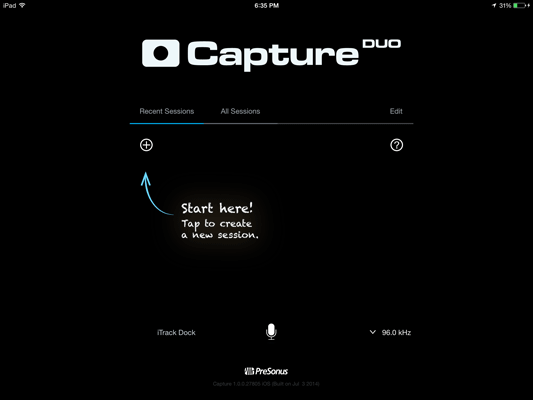 Ensure that you force quit any other apps during recording to keep background functions from interfering with your recording. If you record on an iPhone, enable airplane mode to keep unwanted calls or texts from interrupting as well.